We have taken the very reliable Delco 10SI alternator and configured it to provide higher amperage power for 6-volt applications. Now you can replace your old generator and not have to worry about rewiring the rest of the vehicle. This alternator has a 1-wire regulator so your only connection is a battery cable on the rear of the alternator to the vehicle's battery post. They can also be used to control a dash light by using our W290 wiring harness. This listing is for negative ground configurations. 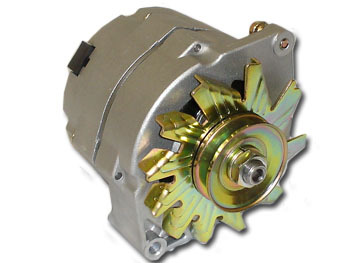 See our bracket section for an easy to use adapter bracket to mount this alternator in place of the existing generator.